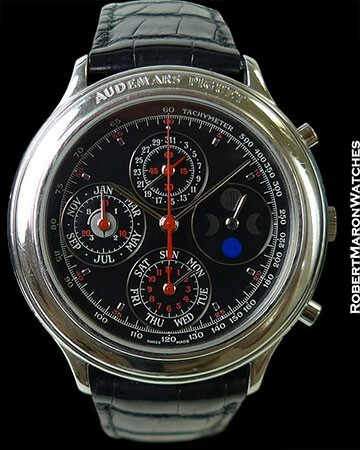 I remember when I first got serious about watches, looking at this watch in watch magazines and watch annuals. So complicated. So prestigious. So great looking. And platinum. I dared not dream of ever owning a platinum watch. This Audemars Piguet Quantieme perpetual calendar chronograph model 25695 features 40mm platinum case with “AUDEMARS PIGUET” engraved on its massive bezel. 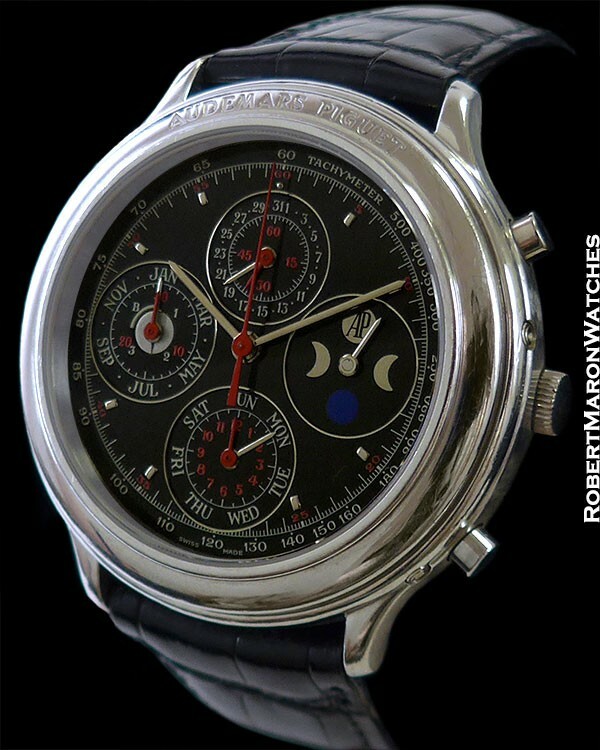 The black dial is the rarest version (most had silver dials), and displays Day, Date, Month, leap year cycle, moonphases, and chronograph 30 minute and 12 hour totalizers. Very colorfully embellished as compared to most black dial watches. Case back is solid platinum and crystal is sapphire. Automatic winding Audemars Piguet Caliber 2126, which is hand finished and decorated. Movement is clean and running. Original black crocodile strap with original platinum tang buckle. Watch is mint condition with box and papers.